Ever since pigs have been domesticated for food, they have unfairly been the object of disdain and abuse from humans. Perhaps this is because most humans would have a difficult time slaughtering a creature they had respect and affection for. As it turns out, pigs are probably the most intelligent domesticated animals even though we’ve long thought otherwise. Pigs are apparently far smarter than cats and dogs according to researchers. Studies on their intelligence began in earnest in the 1990s. One study shows they could move a computer mouse with their snouts to position the cursor in purposeful ways and they could distinguish between familiar and unfamiliar objects on a computer screen. These findings are amazing and counterintuitive to what we’ve assumed ever since the domestication of pigs began 9,000 years ago. Your Room Is a Pigsty! Most of us might imagine a pig rolling around in mud with unabated pleasure. Being outside in the sun on farms, pigs get hot. They don’t sweat, either. They roll in mud to cool themselves down – which hasn’t done much for their reputation. 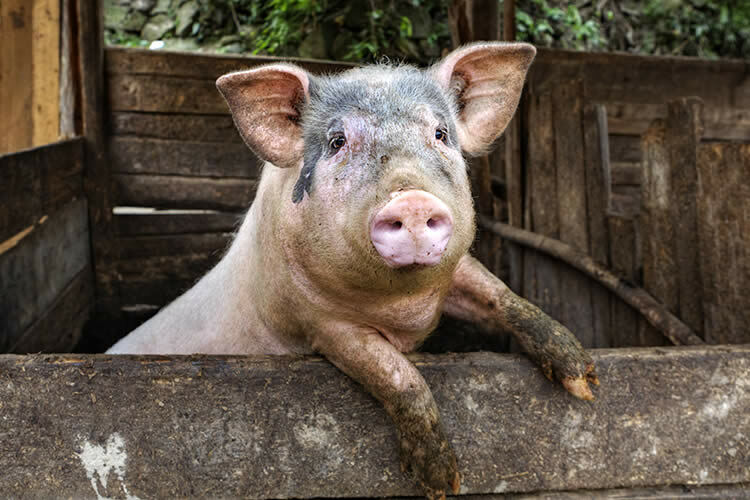 We tend to put cleanliness on the level of cleverness and because we’ve seen pigs covered in dirt and mud, we’ve assumed they are unclever because they are unclean. While they may like to cover themselves in mud to keep cool and prevent sunburns, they don’t like defecate near their sleeping and eating quarters. These barrel-shaped mammals aren’t lazy and they love to play if given half a chance. Frolicking, solving puzzles, and sniffing out roots and truffles are some of the activities they like to engage in. For example, a German woman videotaped her pet pig, Moritz, at play. He used his snout to push colored wooden blocks into their correspondingly shaped cutouts on a wooden board. Much to the world’s delight, Moritz completed this puzzle exercise with no assistance. This is perhaps the most unjust characterization of a pig – greedy, sniveling, and prone to hurt humans. Some stories relate that pigs have intentionally knocked down people and then feasted on them. While there have been scattered stories of pigs eating humans, it should be understood that pigs are omnivores and are known to eat human remains. However, there are probably more verified anecdotes of pigs being affectionate and loyal to their owners. One of the most famous stories is that of Lulu the pig. When her owner, Jo Ann, had a massive heart attack, Lulu escaped her enclosure – wounding herself in the process – and laid down in the road, playing dead. When a driver stopped to see if Lulu was okay, she popped back up, and led the driver to Jo Ann. Lulu saved Jo Ann’s life and has been featured on many shows, including Oprah. Not only was Lulu attuned to Jo Ann’s medical emergency, she displayed deep fondness and loyalty to her as well. On many levels, pigs and humans are similar. Pigs have similar diseases, their teeth look like human teeth, and their social habits seem to mimic ours. It is true that we can learn so much from them. Whether this will affect the way we interact with them remains to be seen. Certainly, the farming of pigs has become so ingrained in our culture that we do not see them as sentient creatures, but rather commodities and chattel. Because of innovative researchers, this one-sided view of pigs may change, albeit slowly.